It is finally here!!! The new Total Beauty Collection sample box arrived on yesterday for me to preview. Total Beauty is joining the beauty "sample box" craze. Their new Total Beauty Collection sample box launches in May. But, Total Beauty is doing things a bit differently. You do not have to subscribe to get this sample box! As you know from my Total Beauty Collection announcement, I have been very eagerly anticipating the arrival of this Total Beauty Collection box!!! Ya'll know that I adore beauty sample boxes. So, I am very curious to see how this box compares. The box goes on sale May 7th for $15.00. You can go to the site now to sign up for an email alert for when the box is available. I would do this ASAP as I am sure they will sell out fast! Here is where you sign up: Total Beauty Collection. My contact at Total Beauty tells me that there is a limited supply of each box. Once they sell out, they are gone. Also, everyone gets the same box. Each box contains 4-5 deluxe sized beauty samples. Samples could include skin care, hair care, and cosmetics. What are my thoughts on this new sample box? Keep reading for my box opening: photos, product description, and my thoughts! As you can imagine, I am not in dire need of beauty products, lol! But still, I love these beauty sample boxes for a variety of reasons. These boxes expose me to new brands and new beauty products. Also, I love it when luxury and boutique brands are represented. I might not have discovered them any other way! Another biggie for me: the packaging! I love feeling like these beauty sample boxes are a little present to myself (from myself, lol). The packaging must be nice! I want to actually feel like I am opening some sort of present or a special goody box. Finally, a sample box must have a good value. The contents must at least meet if not exceed the actual price of the box. So, how is the packaging here? Its great! The slim white outer box opens to reveal a smaller blue green box with Total Beauty Collection embossed on the flip-top lid. You open it to find your product info card nestled on top of the goodies! Everything seems to be packaged with care. The items are surrounded by white shredded paper. I am quite pleased with the box's presentation! Alterna Bamboo Luminous Shine Mist (Sample size .85 fl oz, full sized cost about $18): I love getting hair products in my sample boxes! I have very long, dry, highlighted hair. Shine mists are a *must* for me. I am thrilled to find this in my Total Beauty Collection box! Plus this is such a huge sample in a nice spray bottle. This is ideal for the purse or for travel. Kiss dull hair goodbye with this shine mist, which will give you healthier, glossier hair! June Jacobs Green Tea & Cucumber Body Balm (Sample size 1.6 fl oz, full sized cost? About $50! ): Mmm! This smells just lovely! I am a huge fan of the Green Tea and Cucumber scent. It is very light and fresh. Such a nice scent for this time of the year. I am new to body balms. I have used lip balm and eye balm before, but not a body balm. My first impression is that it is moisturizing yet non-greasy. I think I am going to love this for my hands. Hydrate and replenish dry skin with this balm thats packed with shea butter and the nourishing oils of squalane, sunflower, jojoba, and sesame. Blinc Mascara (Sample size .141 oz, full sized cost? About $20): This is that "tube" style mascara! Funny, I got this exact sample in one of my Birchboxes! No matter though. I am happy to have another! Pevonia $15.00 Gift Card: This is nice! If you think about it, a $15 gift card equals out to the price of the box. So, it is clear that the box's value exceeds its actual price. But, I know there are mixed feelings out there for these types of gift cards being included as a sample. While $15 is a nice discount, you will see on Pevonia.com that most items cost way more than $15. So, if you want to use the gift card, you have to be willing to spend more money to use it. Most items are around the $30 price mark. So, while this is nice, you do have to spend money to use it. I know that I plan to use it. Has anyone out there tried Pevonia? What do you recommend from this line? Overall, I think that Total Beauty did a very nice job with their Total Beauty Collection sample box. The samples included were all deluxe sized (and big deluxe sizes at that!). 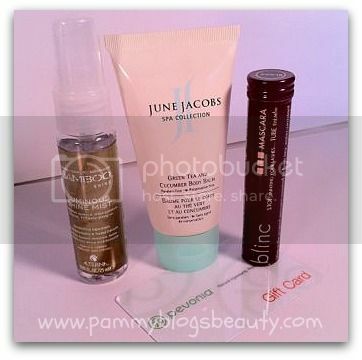 The samples are from high-end and boutique brands that I want to try. These samples will be used for sure! I also love the packaging and presentation of the box. Very well done, indeed! Personally, I would have liked one more sample and then the gift card as the "extra". But still, the box contents' value far exceeds the actual price of the box. So, it is clear that the box is a great deal. Also, I love that you can just buy the box when you would like and not have to subscribe. I feel that is what really makes this sample box stand out in the vast sea of beauty sample boxes. I can't wait to see what is in Total Beauty's next box! So I am a fellow blogger and an elite reviewer on Total Beauty. Do you know how to get your blog added to their site? I am curious how this process works. @the Lacquered Lady-I am not sure what to tell you. I have been with them for about a year and the person who got me started there no longer is with Total Beauty. I think that there is somewhere on their site where you can request to be added?